On Sunday 9th November the Bendigo and Ballarat Squadrons of McCormack Group held a flying fun day at Bendigo Airport. To help promote the Australian Air League the day was turned into an Open Day for the public and was supported by Victoria Group, who with family and friends travelled from Melton, Niddrie, Oakleigh, Cranbourne, Berwick, Waverley and Ferntree Gully. The weather was perfect on the day and the cadets and Officers enjoyed joyflights, a BBQ lunch and other fun activities. Paper planes, balsa wood gliders and kite making kept the cadets andother members of the public busy during the day. 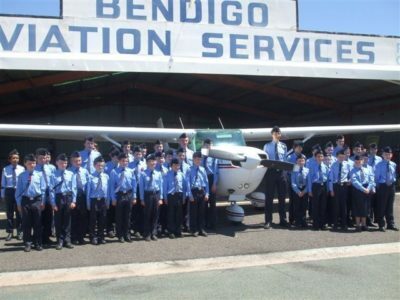 The joyflights for the day for cadets and Officers were organised through Bendigo Aviation Services. Another highlight of the day was a display of 5 warbird aircraft – 3Nanchangs and 2 Yak 52s. For those that were interested, three of these aircraft were available to inspect and joyflights for the public were also available. For those who took the opportunity to fly for the first time, it was an experience they will remember and cherish.